Researchers find surface evaporation drives circulation and summer precipitation in the Tropical West Pacific. In areas with weak surface winds, researchers noted that additional surface evaporation is an important energy source for driving tropical circulations that create rainfall. 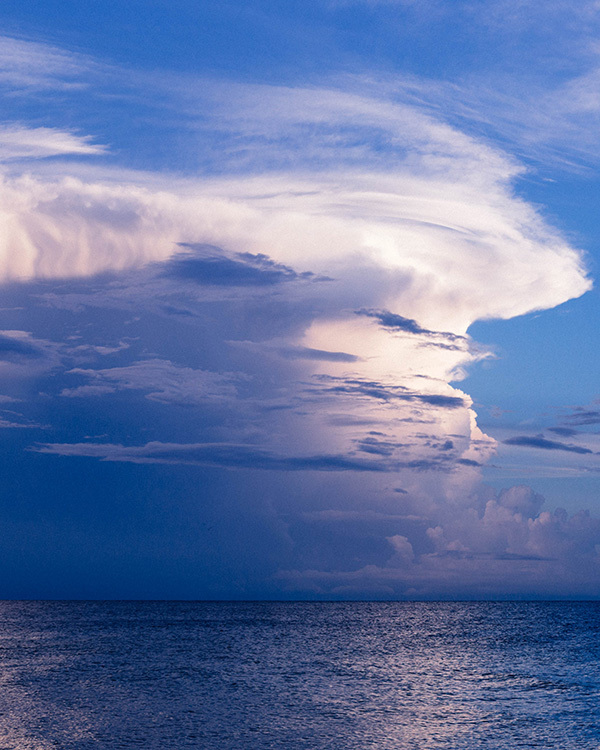 Wind gusts beneath rain storms over the ocean increase surface evaporation, but how this process influences tropical circulations—a key component of the global climate system—and precipitation remains unclear. A research team led by scientists at the U.S. Department of Energy's Pacific Northwest National Laboratory found that the additional surface evaporation is an important energy source for driving tropical circulations that create rainfall in areas with weak surface winds, such as the Tropical West Pacific. In the northern Tropical West Pacific, a region with very strong rainfall and weak surface winds, summertime precipitation is often underestimated in Earth system models compared to observations. Researchers found that accounting for surface wind gusts over the ocean produced more realistic model simulations of rainfall patterns. Earth system models struggle to represent some aspects of tropical circulations, leading to biases (offsets from observations) in tropical rainfall. In particular, models often underestimate summer rainfall in the northern Tropical West Pacific. The simulated rain shortage is related to the low amount of evaporation arising from light surface winds in the region. General circulation models typically neglect wind gusts generated below evaporating rain, but these gusts are known to create circulations that increase surface evaporation. Using the Energy Exascale Earth System Model (E3SM), researchers diagnosed that the increased surface evaporation from these "gusty winds" acts as a local source of moist energy to the atmosphere. This energy intensifies the circulation and total surface rainfall amount. Clarifying the role that surface evaporation plays in increasing rainfall has improved understanding of tropical circulations. Sponsors: This research was supported as part of the Energy Exascale Earth System Model (E3SM) project, funded by the U.S. Department of Energy (DOE) Office of Science, Biological and Environmental Research. User Facility: The research used computational resources of the National Energy Research Scientific Computing Center (NERSC), a DOE Office of Science user facility.